C.M. Fuller, I.I. Ismailov, B.K. Berdiev, V.Gh. Shlyonsky, and D.J. Benos, Mapping Structure/Function Relations in alpha-bENaC. P.M. Snyder, C. Cheng, and M.J. Welsh, Membrane Topology, Subunit Composition, and Stoichiometry of the Epithelial Na+ Channel. T.R. Kleyman, I. Ismailov, F. Kosari, B.K. Berdiev, J. Li, and S. Sheng, Subunit Stoichiometry of Heteroligomeric and Homoligomeric Epithelial Sodium Channels. N. Farman, S. Djelidi, M. Brouard, B. Escoubet, M. Blot-Chabaud, and J.P. Bonvalet, Cell-Specific Expression of EnaC and its Regulation by Aldosterone and Vasopressin in Kidney and Colon. D. Rotin, O. Staub, P. Plant, T. Ishikawa, and L. Schild, Regulation of EnaC by Interacting Proteins and by Ubiquitination. S. Sariban-Sohraby, Role of G-Proteins in the Regulation of Apical Membrane Sodium Permeability by Aldosterone in Epithelia. J.P. Johnson, J.-M. Wang, and R.S. Edinger, The Role of Post-Translational Modifications in the Cellular Mechanism of Aldosterone. J.A. Schafer, L. Li, D. Sun, R.G. Morris, and T.W. Wilborn, Regulation of Amiloride-Sensitive Na+ Channels in the Renal Collecting Duct. P.R. Smith, cAMP Mediated Regulation of Amiloride-Sensitive Sodium Channels: Channel Activation or Channel Recruitment? J.K. Bubien, Human Lymphocyte Ionic Conductance. H. Cantiello, Regulatory Aspects of Apx, a Novel Na+ Channel with Connections to the Cytoskeleton. C.R. Talbot, Species Specific Variations in EnaC Expression and Localization in Mammalian Respiratory Epithelium. S. Matalon, M.D. DuVall, and A. Lazrak, Inhibition of Vectorial Na+ Transport Across Alveolar Epithelial Cells by Nitrogen-Oxygen Reactive Species. H. O'Brodovich, B. Rafii, A.K. Tanswell, and O. Pitkänen, Induction of Epithelial Sodium Channel Expression and Sodium Transport in Distal Lung Epithelia by Oxygen. Y. Marunaka and N. Niisato, Catecholamine Regulation of Amiloride-Sensitive Na+ Transport in the Fetal Rat Alveolar Epithelium. S. Guggino, Cyclic-Nucleotide Gated Cation Channels Contribute to Sodium Absorption in Lung: Role of Non-Selective Cation Channels. M. Driscoll, H.A. Thieringer, S. Sahota, and I. Mano, C. elegans Members of the DEG/EnaC Channel Superfamily: Form and Function. S.C. Kinnamon, B. Lindemann, and T.A. Gilbertson, Amiloride Sensitive Sodium Channels in Taste. D. Benos, The Involvement of Amiloride-Sensitive Na+ Channels in Human Genetic Hypertension: Liddle's Syndrome. I.I. Ismailov and B.K. Berdiev, Epithelial Sodium Channels in Cystic Fibrosis. Sodium reabsorbing epithelia play a major role in whole-body sodium homeostasis. Some examples of sodium regulating tissues include kidney, colon, lung, and sweat ducts. Sodium transport across these membranes is a two-step process: entry through an amiloride-sensitive sodium channel and exit via the ouabain-sensitive sodium/potassium ATPase. The sodium entry channels are the rate-limiting determinant for transport and are regulated by several different hormones. The sodium channels also play a significant role in a number of disease states, like hypertension, edema, drug-induced hyperkalemia, and cystic fibrosis. 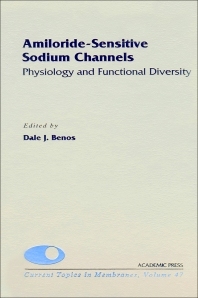 Amiloride-Sensitive Sodium Channels: Physiology and Functional Diversity provides the first in-depth exchange of ideas concerning these sodium channels, their regulation and involvement in normal and pathophysiological situations.